I first made this Citrus & Brussel Salad with Bacon on a night I did not want to cook, but wanted something yummy. It was incredibly easy to whip up, and all the flavors just go so well together. The bacon here was almost like pork belly, it was sooo thick and yum. There were only 4 slices in the package! Definitely something I recommend using for this dish as it added that something special, however, regular cut bacon would work as well. You can omit the quinoa if you don’t eat that and replace with cauliflower rice. Cook bacon in iron skillet with a good sprinkling of fresh ground pepper. While this is cooking you can make the salad. Prep your brussels and run through a chopper or shredder, dump into a bowl. Larger chop your red cabbage and add to bowl. Peel and add clementine sections. Add all dressing ingredients into a glass jar and shake it like a polaroid picture! LOL Pour over salad. Top with sunflower seeds. When bacon is done you can chop into bite size pieces and add to salad when serving, or you can serve whole on top! 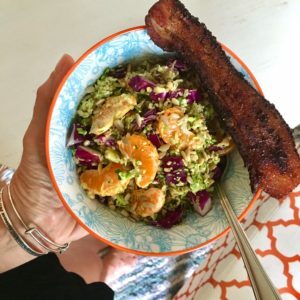 Please tell me if you make this Citrus & Brussel Salad, my hubby and I just loved it, maybe it was the bacon. Haha.